Today I want to elaborate on a topic I touched on yesterday. 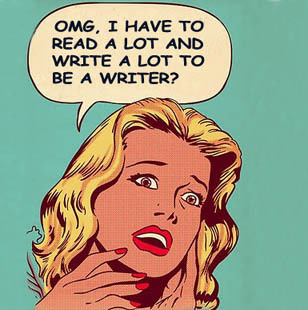 I would argue, at least from my own experience, writing is very hard work. It’s not easy to write a story. Everything is against you. Time, quality, need of story, laziness, readiness, you can name a hundred different obstacles you have to overcome just to write the story. The one thing I have to dismiss, mostly out of observation and verifiable evidence, is talent. Talent in any form is absolutely unnecessary when it comes to writing the story. I wish it were otherwise, but that’s simply the case. You don’t need talent to write a story. I know this from experience because I have seen many stories, published and unpublished, that were written and conceived without any verifiable talent in evidence. Furthermore, talent is unnecessary (as much as it pains me to admit) when it comes to publishing a story. Particularly in this day and age. But let’s face a hard truth here. Mediocrity has often been the benchmark. Do just enough to squeeze by, hit a chord with people, and you can be hugely successful. Jean Auel, Harold Robbins, Jackie Collins, Robert James Waller and a ton of other “successful” writers prove the point (at least to me) over and over. So there’s nothing under the sun that can be done about that. We writers who try to view this profession in more serious terms of organic art have to accept that fact. I don’t begrudge them their success. But I don’t have to read their tripe, either. And I don’t. Which brings us to the focus of this post. So you finally wrote a story. Congratulations! It’s a big achievement and never let anyone tell you otherwise. You know how many people never start and then finish a story? Most. So you are already ahead of the game. Therefore, congratulate yourself because you deserve some recognition. As difficult as writing is, and I maintain it is extremely difficult (particularly if you want to do it well) writing the story was the easiest part of the entire process. Now you have to be judgmental. And there is no worse judge of his own work than the writer who wrote it. That scene you like so much and you think is the centerpoint to your story? It’s probably not that good. That paragraph you are thinking of tossing because in your mind it just doesn’t work? More than likely it needs to remain because it’s central to the character growth. There is no worse judge of a story than the writer who wrote it. So what can you do? Find a beta reader. Better yet, find two or three. And, no, I don’t mean family members (unless you know they can read critically) who will by default like what you wrote and not want to hurt your feelings. I mean find a cynical judgmental hard-hitting no-holds-barred beta reader who, while he may like you personally, has no problem at all telling you if your story is crap. Sound rough? That’s just the beginning. It gets rougher, believe me. You have to put your ego aside and listen to the criticisms that fly your way. As my writing buddy will tell you, there are few people who have a smaller ego than myself. But when push comes to shove I don’t care what I think, I care what the editor thinks, and if he has a way to improve the story then I am on board with that. Because I want one thing: to make the story as good as it can possibly be. I don’t care about my feelings, or what I like or don’t like about the story, or how I think it should proceed. I have written the story. Now it’s time to let someone else judge the thing on its own merit. Hey, it’s not all bad. Maybe the beta reader will like the story and have a few criticisms and changes you need to think about. Or maybe he will tell you to stop killing trees…or I guess in this day and age stop wasting valuable electrons. Now the difficulty scales up on a hyperbolic curve. You have to submit the story, often again and again before it finds a home. That entails researching guidelines, markets, the list is enormous. And then the story gets bought and you have to think about marketing strategies. It never ends. You are swamped in detail. Amidst all this…you have started your next story. That’s right. You don’t keep patting yourself on the back. You write another story. You keep running the marathon knowing you are never, and I mean NEVER going to reach the finish line, because there is always one more story to write, one more idea in waiting. Writing never ends. It’s organic and it continues, and has continued throughout our history. I am very cynical when it comes to the human species. But there is one cool thing I know about us. We will always tell stories if we have the chance to do so. As hard and difficult as writing is, I like knowing I am part of that long process that defines us as thinking, seeking creatures who want to understand their place in the universe. A good writer tries to do that with every story. “I like knowing I am part of that long process that defines us as thinking, seeking creatures who want to understand their place in the universe”, with these words you have finally won me over, K.M. Somehow, previously, there was always a slightly brittle feel to your posts. So relieved to know that you aspire to thinking and seeking and understanding! Possibly it is my failure to see these desires in your previous posts due to some subliminal prejudices against guys with Main Street haircuts, or something! Just kidding. The last two paragraphs in this post are very helpful!